This season, we celebrate one of EPC’s favorite artisans, Alberto Segura whose award-winning ceramics are sold through only a handful of galleries and shops. Mr. Segura lives and works in Nasca (or Nazca), Peru in the desert about eight hours southeast of Lima. Using the same techniques as the ancient Nasca ceramists (200 BC thru 700 AD) Segura carries on Nasca’s culture–famous for its pottery, textiles, and architecture (including aquaducts that are still used today). Sr. Segura collects the ingredients for his clay in the desert. 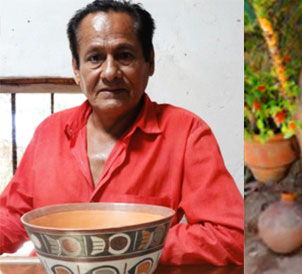 After mixing the clay by hand, he dries it in antique clay pots (formally used to store Pisco), and then forms each piece (by hand) using very small coils. Using tools that he has made, at leather-hard stage, he paints a “slip” on the clay and let’s it dry. Once dried,he then paints over the slip using minerals that have been ground in an antique mortar and pestle. Finally, the pot is burnished with a stone, then fired in wood burning kiln. Sr. Segura shares his studio with a variety of birds, including an owl. When I worked in his studio he would rise at 5 every morning to collect water for the day (Nasca only has water for a couple hours a day, he fills all available containers for use in the studio and for family use). Outside the city limits, water is delivered once a week by truck, each household has a barrel that gets refilled). Alberto is an authority on the Nasca Culture and we are endlessly proud to share his work with you!